Winter is the time of the year when your body needs an energy boost and a strong immune system – by starting your day with oats, you can move a step closer to both these goals. Oats combine fibre and complex carbohydrates, providing a stable and durable source of energy, as they take time to be digested by our body. This will prevent you from experiencing a biorhythmic energy crash (a rapid lowering of blood sugar levels) and will keep you feeling full for longer. 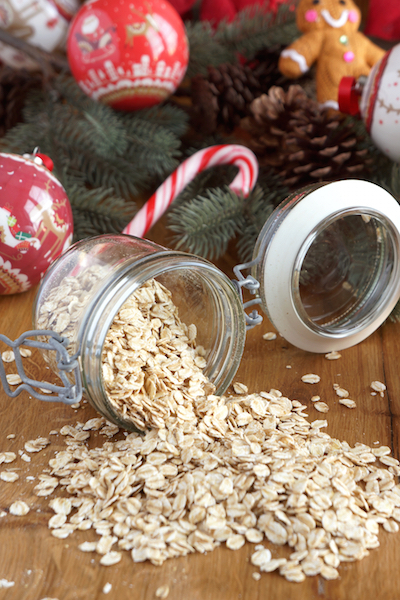 The Vitamin B1 (thiamine) found in oats promotes the conversion of carbohydrates into glucose, essential to energy production. Boost your immune system response! Oat’s beta-glucan, a soluble fibre, stimulates non-specific immune cells – neutrophils. These cells are the first to be sent to a source of bacterial infection. Thanks to beta-glucan, neutrophils are deployed more rapidly and more effectively, enabling the body to produce a far more potent counter-measure to invasive pathogens. 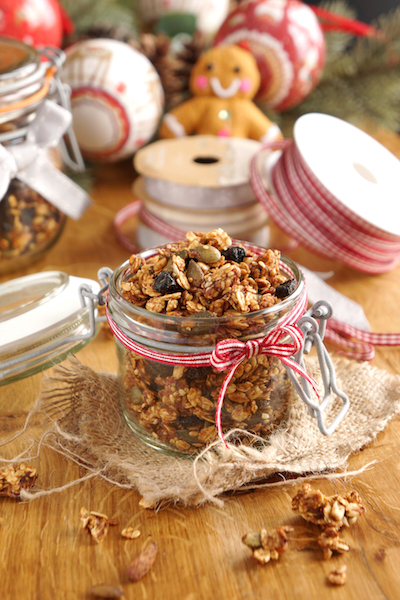 This ‘Sin-amon Granola’ is the perfect way to incorporate oats into your morning routine – it’s so addictive that you will catch yourself snacking on it throughout the day. I especially love adding granola to my smoothies as it gives me an extra kick by turning each drink into a deliciously full breakfast (see Facebook, Instagram or Tumblr for smoothie inspiration). Preheat the oven to 170ºC / fan 150ºC / 340ºF. Start by placing the almonds, walnuts and pecan nuts in a food processor. Blend briefly until chopped (alternatively, you could place the nuts in a zip-top bag and roll over them with a rolling pin). Add the other dry ingredients. Set aside. In a saucepan, heat the coconut oil, maple syrup and medjool dates on a low heat until the date pieces have melted (you maybe want to help a bit with a spatula). This should take 5-10min. Fold in the cinnamon and take the saucepan off the heat. Pour the mushy sweetener over the dry ingredients and mix until everything is coated. 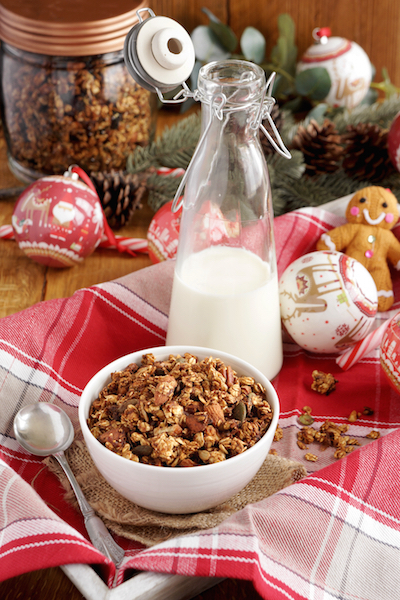 Spread the granola evenly on the baking tray covered with baking parchment (use the same as before). Bake for 20min, stirring 2-3 times. Take out and leave to cool. 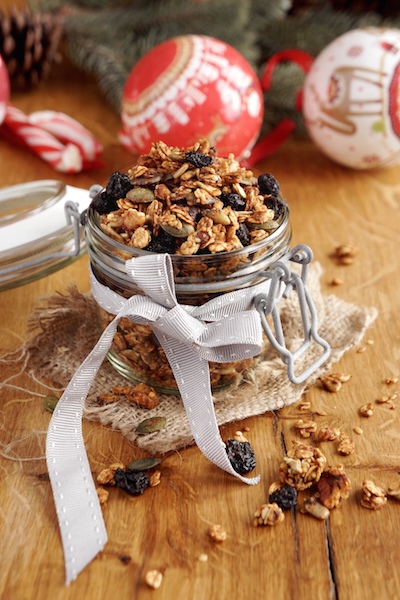 The granola will get crunchy while cooling down. When cool, add the dried blueberries. Store in an airtight container. Allergic to nuts? Just exchange them for more seeds and oats. Swap the maple syrup with honey if you prefer. At the end you can add whatever dried fruits you like – even chocolate chips and yoghurt coated fruits work well! 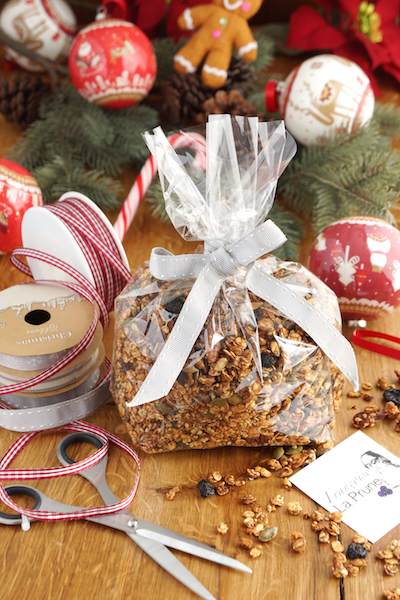 This granola is a perfect gift as it keeps easily for a month or longer in an airtight container! the world’s healthiest foods; Wikipedia; All About Oats; University of Maryland – Medical Center. White dessert bowl; tartan napkins; ribbons from Waitrose and Henry’s Future; Christmas decoration from Waitrose and Clintons; spoon from Covent Garden Antique Market. For more Françoise La Prune, follow me on Facebook, Instagram, Twitter, Tumblr, Pinterest, Bloglovin’ or subscribe to receive the newest posts via email. This entry was posted in Food, Food Photography, Food Styling, Recipes and tagged breakfast, nuts, photography, seeds, vegan, vegetarian by Françoise La Prune. Bookmark the permalink.